This 5 star hotel is characterized by its traditional architecture and its multi-level terraces. It is located on a cliff, overlooking the blue waters of the Aegean Sea and the volcano island. This property allows children over 13 years old. The junior suites offer an elegant romantic-style bedroom, a seating area, a luxury bathroom with a bath or shower and a private veranda. They have stunning views of the sea. Gift of a bottle of wine upon arrival. It offers an elegant living room, dining area and private veranda with views of the sea and the volcano. The bathroom is luxurious and is equipped with a bath or shower. It offers an elegant lounge, dining area and a private veranda with an outdoor hot tub. The luxurious bathroom has a shower. 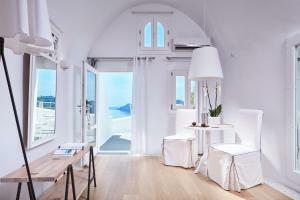 The private porch has stunning views of Santorini. 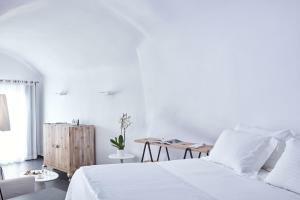 Suite with modern and elegant design. It has a luxurious indoor hot tub with stunning views of the caldera. It includes an elegant dining room, a luxurious bathroom with bath or shower and a private porch with sea views. A bottle of wine is offered upon arrival. It presents an elegant and modern design. It offers views of the caldera and features a hot tub, a beautiful dining room and a luxurious bathroom with a bath or shower. 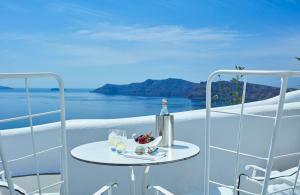 Upon arrival you will receive a bottle of Santorini wine and a fruit basket. This suite has a balcony, an iPod dock and a minibar. Suite with terrace with small pool, sea view, open-plan living room, dressing room and bathroom with shower cabin. This suite has a porch with a small outdoor pool and views of the Caldera. It also has air conditioning, a living room, a bedroom and a bathroom with a shower. Free WiFi is available. Butler service is available upon request. Daily maid service 2 is provided daily.